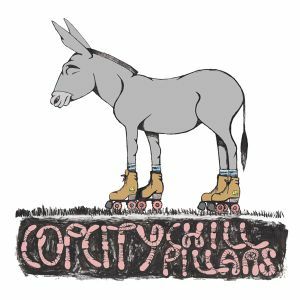 After delivering one of our favorite albums in 2012 COP CITY/ CHILL PILLARS are back again with their twisted psychedelic pop. Their new 7″ on Hozac Records, Gift Shop, is a seamless continuation of their previous LP Hosed. Our guess is as good as yours why these songs weren’t actually part of Hosed considering they’d fit so well. But we’re not complaining because now we get to share more of this squishy psych pop with you. “Gift Shop” serves as a quick refresher of their sound, coming along with washed out guitars and wonky bass lines that bleed into each other like watercolors. The combination makes for a thick and warbled mess as the guitars ooze a pungent neon slime, followed by murky vocal chants and tribal drumming for a deliciously warped sound. Slithering guitar breakdowns lead us right into a wave of frantic drumming, decorated by quivering synths and possessed vocals. “Brand New Neighbor Blues” starts with a wobbly guitar twang colored by sci-fi synths and monotonous, mind-controlled vocals. The muddy bass lines trap you in a gooey tangle under the grime, driving this crooked song from the bottom up. To put it as simply as possible, if you were a fan of Hosed than you need to hear this 7″. Listen to both sides of this crippled psychedelic pop below! BUY the 7″ directly from Hozac Records – GOLD edition still available ! 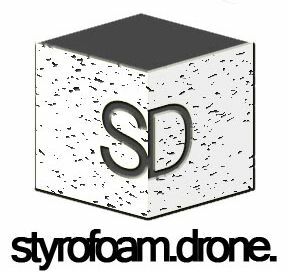 Posted on August 7, 2013 by styrofoamdronePosted in 7", Reviews, Still Spinnin'Tagged electronic, experimental, pop, psychedelic.